This poem carries a deep meaning. They are thoughts of Dasganu. 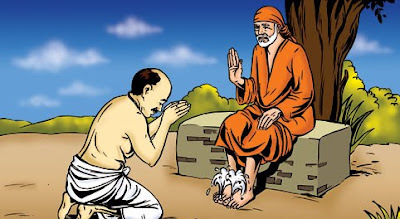 In Chapter 4 of Sacred Text - Sai Satcharitra, Once, Das Ganu thought that he should go to Prayag for a bath, and came to Sai Baba to get His permission for doing so. Sai Baba replied to him - "It is not necessary to go so long. Our Prayag is here, believe me." Then wonder of wonders! When Das Ganu placed his head on Sai Baba’s Feet, out came or flowed streams, of Ganga - Yamuna water, from both the toes of Sai Baba. Seeing this miracle, Das Ganu was overwhelmed with feelings of love and adoration and was full of tears. Inwardly, he felt inspired, and his speech burst forth into a song in praise of Sai Baba and His Leelas. But he did not drink that water thinking Sai Baba to be a Muslim. Later, he realised his mistake and confessed it before Baba. The following poem beautifully narrates feelings of Dasganu during his confession. Neither could I catch the thieves, nor neither my inner thief got away. I had fun in my happy going nature and was dance - song crazy. I used stick of Police and issued orders. While roaming about I found you. But I did not understand. I ran after thieves, but could not hold on. Neither could I catch the thieves, nor neither my inner thief got away. I did not understand Your Games. At last i came to You after roaming many places. One day I said, "I wish to go to Prayag for bath to succeed my life. Baba ... You said, "Where will you now, you will get Ganga - Jamuna here." I said this and out came Ganga - Jamuna from Your Feet. People took that water and touched their eyes, tongue and applied it to their hearts too. But I did not understand Your game. That day I missed Your love. Baba, Neither could I catch the thieves, nor neither my inner thief got away. Later, i repented much, my faith trembled and my patience shook. Yet You were not lost and put Your love to turn the whole game. You showered Your love on me and gave me nectar of Your leela. Sadguru...I did not understand Your Sports. You only made thief inside me run away.